Moving Services To Spain - What Should You Leave Behind? Moving services to Spain are different to moving services within the UK in a number of ways, but there are some things that won�t change whether you are moving down the street or moving to a completely new country. One of those things is what you should leave behind in your old house. 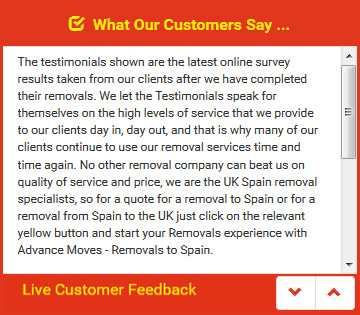 Removals to Spain will, of course, take all of your furniture unless you choose to store some of it in the UK; and anything you have packed. However, there are some things that you will probably want to leave behind. When selling a house in the UK, you will be asked to complete a fixtures and fittings form which details what will remain after you have moved. What should you include on this form? Fitted kitchen appliances � those that are housed within cabinets � are usually left behind, as they are part of the kitchen itself. They are also difficult to remove without damaging the cabinets themselves. Any freestanding items such as fridges, freezers, or dishwashers are usually taken, though. If you are not planning to take the freestanding items with you when using removals from Spain to UK services or vice versa, and the new owners don�t want them, then your local council may be able to remove them for you. Other things that are often left behind include curtain poles and curtains, bathroom cabinets, garden sheds and ornaments, greenhouses and carpets. In the UK, you should also leave your wheelie bin behind, especially if it was provided by the council! The best in moving services to Spain are offered by Advance Moves. Our website has the option of a quick quote (http://www.advancemoves.com/), or you can contact us personally on 0871 218 0612 or email info@advancemoves.com. No matter where you are moving to in Spain, or from Spain, we can help you.